The sustainable couture fashion line, Prophetik designed by Jeff Garner of the United States will be seen on the runway at the inaugural Eco Fashion Week Australia taking place in Perth from November 23 - 27, 201. 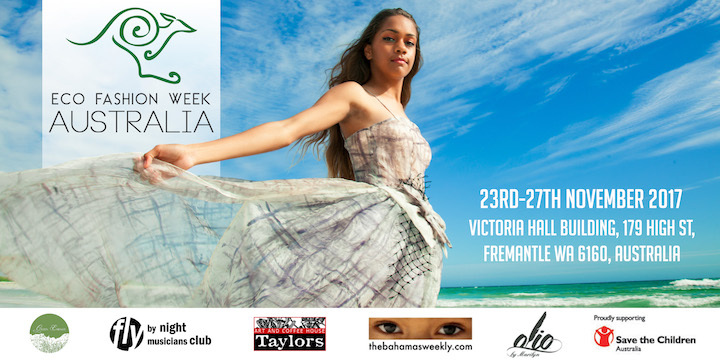 The week-long event will take place in Western Australia and will feature designers who practise sustainable, ethical production, either by recycling or upcycling, or use organic and natural materials which do not leave a carbon footprint. I just started to listen… there is so much art out there ready to be released. My friends were all in bands in the south and needed to connect their art audibly with visual hence my design began. I could never follow a passion that hurt others or the environment in which I played in everyday on horseback. It is every designer’s role to be responsible for what they create and how it affects the world and the people that wear it. In my view their is no such thing as zero waste for we are always making more, but we can design clothing that is made of natural fibers and dyes that can last a lifetime and beyond to pass down to future generations. I find it in nature and my travels and other individual’s passions. This season will be working with the craft ladies of an old art form in Madeira. A part of me really does not like all these new “eco” terms…seems quite confusing… we use natural fabrics and dyes. I try to find the best solutions to serve the most sustainable purpose. I have seen Chinese owned textile companies attempt to synthetically produce “eco” “recycled” or some new name fabrics only to serve the purpose of gross volume fashion to have a “eco” solution. Nothing synthetic will ever replace natural, nor be a better solution, no matter what the marketing claims. The biggest challenge in the sustainable sector is breaking the addiction cycles of consumers even after much education and awareness. We are addicted to cheap fashion and buying more for less that feeds that emotional state of newness fed by marketing and trends again of big volume fast fashion companies such as H&M and Zara that cannot not sell enough for their bottom line. They have created throw away fashion making garments as cheap or cheaper then they were 30 years ago while everything else in life has become more expensive by natural inflation. Someone will suffer for these cheap price points and it is not the companies selling the garments but the consumer and Mother Earth. We must stop this addiction before it is too late. As a designer my biggest challenge is material limitations and the very intense process of our plant dyes. You will see the new collection based on the beautiful history of Madeira and the culture of the time of great exploration, travel and trade. Every aspect of my farm and the way I live. They should vocalize their concern regarding the health implications of wearing synthetic dyes and fabrics not only to the cost of the environment.